Note from the editors: We’re kicking off our Summer Reading series! In this series, Journal editors talk about what they’re reading / watching / listening to / studying this summer. Read for recommendations, insight into our editorial staff, and a general good time. Our first post is from Cady Vishniac, an incoming Associate Fiction Editor. 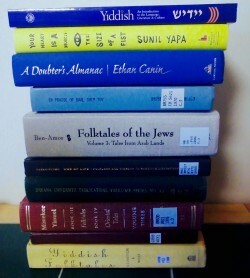 Right now, I’m allowing myself two novels, Ethan Canin’s A Doubter’s Almanac and Sunil Yapa’s Your Heart Is a Muscle the Size of Your Fist, as well as several thick academic texts about Jewish folklore. Later on this summer, I’m learning Yiddish at the six-week Uriel Weinreich Summer Program in New York, and I’m workshopping novel chapters with a classmate. I’m preparing two or three stories for my upcoming semester, fighting about politics on the internet, writing a new group of poems and a couple flash pieces, submitting like there’s no tomorrow, visiting family, training to be a composition instructor, gardening, attending the Kenyon Review Writers Workshop, and making Lego castles with my daughter, all in no particular order. Still, the bulk of my alone time is actually focused on other writers’ unpublished fiction, their submissions to the lit mags for which I screen or their workshop stories. Since my last class of the semester I’ve I polished off the hundred-plus fiction submissions we received at Reservoir, where I am the fiction editor, as well as the hundred-fifty or so I was assigned at Raleigh Review, where total fiction subs were closer to three hundred-fifty. I’ve been working on copy edits with the four authors chosen at Raleigh Review and will soon start revisions, copy edits, and proofreading at Reservoir. I’m also due to get a large batch of fiction subs from The Journal any day now. I also participate in and help run a Facebook workshop group, and read the work sent to me by my extremely talented friends. Let’s take today. Today, I’m going to finish up this blog post, then plow through detailed comments on five or six stories from my friends and my online workshop. Or tomorrow. Tomorrow, I’m working up at least six revision requests/copy editing notes on work forthcoming in Raleigh Review and Reservoir. I know a lot of MFA students and professional writers view what I’ve just described as busywork, but I love reading and working on other people’s stuff. I feel more than fortunate to have been allowed the privilege, because constantly leafing through many, many stories has taught me which of my ideas are so common as to be kind of boring, which of my written tics are also other writers’ written tics. More than that, I enjoy helping people. I enjoy being a good literary citizen. And this summer, I’m enjoying the collaborative process of making a piece of fiction the best it can possibly be.